The Marvel’s newest entry to the Marvel Cinematic Universe – Ant-Man begins to land in theatres worldwide today! Our new hero, Scott Lang, will don the Ant-Man suit with the astonishing ability to shrink in scale but increase in strength and help his mentor Dr. Hank Pym to save the world against Yellowjacket whom will use the same technology as a weapon of evil. To celebrate the release of this new film, Hot Toys is excited to present today, the 1/6th scale Ant-Man Collectible Figure! 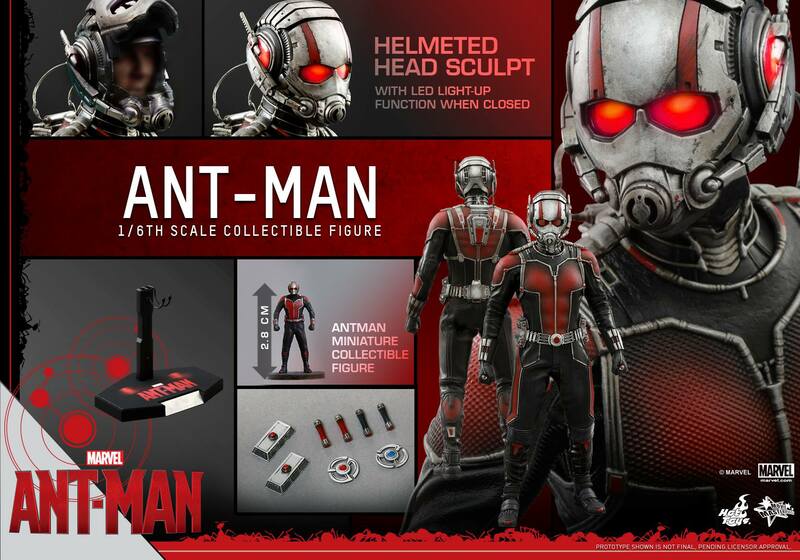 The movie-accurate Ant-Man Collectible Figure is specially crafted based on the film featuring a newly developed helmeted head sculpt with authentic likeness of Paul Rudd as Scott Lang in the movie and LED light-up function when helmet is closed, specially tailored Ant-Man suit, an Ant-Man miniature figure, detailed accessories and a specially designed figure stand.